ikepela is redambition: Pyjama Party! You may recall that back in November (look, just go read the previous post. It's not like this place has been overloaded with content since then) I picked up sewing again. Well, I've actually been sticking with it and I've even taken a class! Progress is being made. I do have quite a few finished items, and now that I have a fancy new camera setup I can even take pictures without doing dodgy selfies in the mirror - so expect some more photos if the temperature creeps up above F R E E Z I N G some time soon. But I digress. This post is about pyjama pants. The lovely Karen from Did You Make That? is hosting her second pyjama party sew-along, and I (madly, some might say) decided to join in. It was focussing on the new Sewaholic Tofino pattern, which I had impulse purchased on the day of release. Yes, I know that I can buy pyjama pants from any one of a number of low-priced department stores. The problem is, you see, I've been scarred. For as long as I can remember, if I had a pair of pyjama pants that fit me in the waist and hips, I could guarantee that my ankles would be cold. They'd always end up flapping about somewhere midway between my calf and my ankle. The only other option was to buy several sizes too big - but then if there was no drawstring in the waist, I'd have a whole new raft of problems. Aside from investing hours knitting long socks in cosy DK weight wool, what was a girl to do? Learning to sew (and the release of the Tofino pattern) made me realise that I no longer had to put up with cold ankles. I could be free! Free to lounge around in PJ pants whenever I wanted - and BE WARM! The pyjama party conveniently also provided me with a deadline for completion. I would have new PJ pants for winter. Sold! So I decided that eye-searing fuchsia was the way to go. I mean, what's a pair of PJ pants if they're not obnoxiously bright? So besides the two warnings I've already given (me in pyjama pants and eye-searing fuchsia), I also need to warn you about these photos. They're not going to be fantastic quality, as it was my first go taking selfies with my new setup. It was also about 10 degrees when I took these and I was really, really keen to get back into warmer clothes. So I rushed and took many terrible photos. Anyway, enjoy the noisy, gritty quality. It's urban. It's a thing. (Yes, that's a Terry Pratchett book on the table and there's also an Oatmeal print loitering behind the couch.) By the way, did you notice the piping? Yes, I made the piping. See how delightfully long they are? THE GROUND! THEY ARE TOUCHING IT! 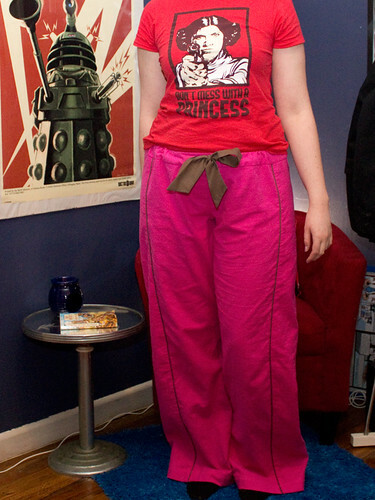 I'm very chuffed with my new pyjama pants, even though I have exactly zero construction pictures to show you. You'll have to take my word when I say that the instructions written by Tasia are extremely clear, and the pattern really is suitable for a beginner. 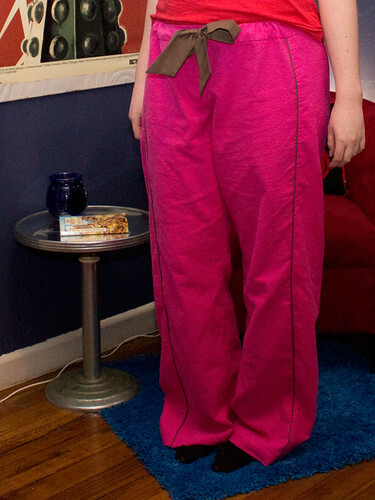 Being PJ pants, the fit is relatively relaxed and the elastic waist means it's very forgiving. It's a great pattern to get familiar with the techniques used to construct pants (or trousers if you're from the UK), without the stress of trying to fit them precisely. Thank you Karen for running the Pyjama Party sew-along! Now, did I mention that I was doing a second sew-along? Whose dates overlapped with the pyjama party? How's my progress on that going..? 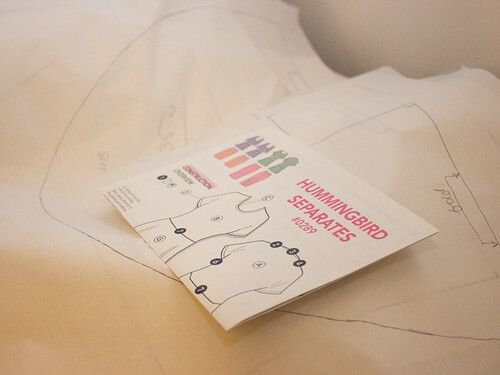 Well, my pattern (Hummingbird Separates from Cake Patterns) is traced. Pity I've now got less than half the time of the sew-along left to actually complete the garments. Yes, plural. Oh dear. Terry Pratchett and PJs - what more could a girl ask for? Thanks so much for taking part! Yay! For both the pants and the geek stuff. Great pjs! I feel your pain. I was always too tall for pjs in the department store. There is a shop that sells cute long legged pjs in Australia but their about $80 each! Ouch! Love the Dalek poster too. Are you sad that Matt Smith is leaving? Your pjs are lovely! I really like the color combination. I'm doing the hummingbird sewalong as well. See ya over there. Catherine - I totally understand that. $80 for a pair of PJs is just far too steep for my liking, especially as they never seem to last a long time anyway. Catherine - I missed the bit about Dr Who! I am a bit sad about mat leaving (another regenration gone.... gasp!) but... we never know! Truth be told I am very behind in watching the Doctor.. I need to rectify that!